Every canoe on this website will be handcrafted per customer. Curently running about eight weeks before orders will be shipped. Order soon to have a place on our building list. Below is our new wall bracket that will hold our 5 long' model canoes on your homes wall for display. Paddle wall hanger we call it. Buy one today using the added paypal buttton or the big red pay now button. Built for 100% northern white cedar. Below is our green canvas distressed canoe model. 8' long x 17" wide. Nice deep canoe. comes with two paddles and wall mounts. Each 5' canoe will be 60" long x 10" wide. Each 8' canoe will be 96" long x 17" wide. Each canoe will be handcrafted per customer. 8' canoes are all cedar and cherry wood for the trim. Please add 500.00 extra for canvas and paint on the 8 footers. We will do any color paint of your choice. Click image above for more information on this great canoe light. We are very happy to have built this custom canoe for Carlos and maria santos. efforts in three communities. Oct 3 on PBS . 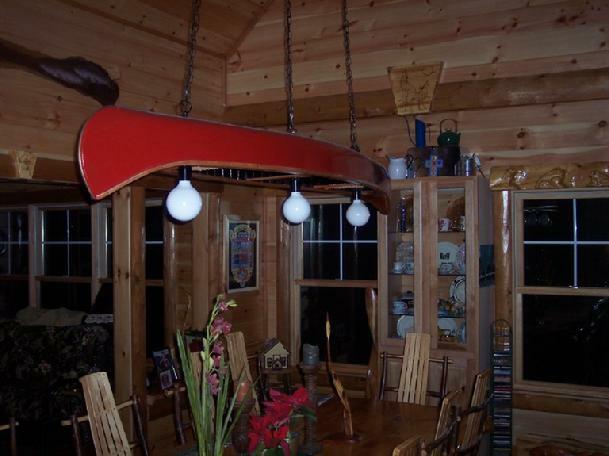 Carlos added the lights to the canoe,and did a great job of hanging the canoe in his home. stop at 17.27 to view canoe light. Join in on the fun ? Click my webcam link and it will let you enter my canoe shop. You will see how we build wooden canoes. Cell 207-965-5638 or text message. We now hand cane wooden canoe seats, and fix damaged seats as well. Complete wood and canvas canoe Restoration. Custom orders to fit your needs, no job to big or to small. Above is our new lawyers thinking slat-Back rocking chair. This rocker will ship via FedEx . Please allow 3 months for building time. Del Cover granted us permission to build these famous cherry slat-Back rockers. Hand rubbed oil finish will surprise you for sure. Its a big rocker for sure. Custom 8' long dinning room table light. Let little bear canoes build your next dinning room table light. Little Bear Company Coffee Cup/Price is for one cup. Don't forget to ask about our full size 17' canoes.